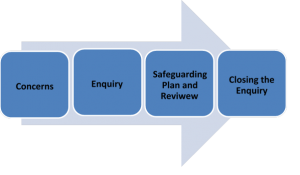 The main objective of adult safeguarding procedures is to provide guidance to enable adults to be kept safe from abuse or neglect and immediate action to be taken where required in order to achieve this. These procedures are a means for staff to combine principles of protection and prevention with individuals’ self-determination, respecting their views, wishes and preferences in accordance with Making Safeguarding Personal . 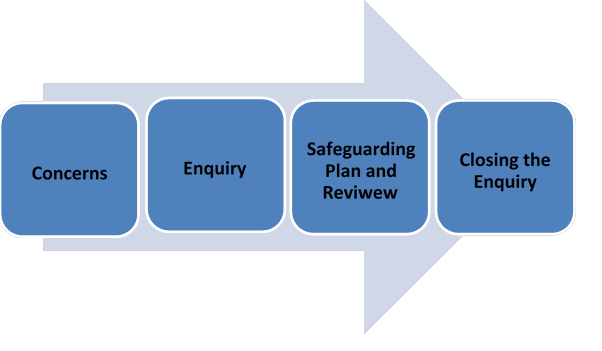 They are a framework for managing safeguarding interventions that are fair and just, through strong multi-agency partnerships that provide timely and effective prevention of and responses to abuse and neglect. All organisations who work with or support adults experiencing, or who are at risk of, abuse and neglect may be called upon to lead or contribute to a safeguarding concern and need to be prepared to take on this responsibility. Guidance is often criticised for over-standardising practice and undervaluing the skills required when applying policies in diverse circumstances. The key focus is on using professional skills to gain a real understanding of what adults want to achieve and what action is required to help them to achieve it. Before going through each stage of the process in depth, the next section will define roles and responsibilities and provide context within which the procedures operate. ‘Local authorities can continue to enter into partnership arrangements with the NHS for the NHS to carry out a Local Authority’s ‘health-related functions’ (as defined in the 2000 Regulations (NHS Bodies and Local Authorities Partnership Arrangements Regulations 2000). This effectively authorises NHS bodies to exercise those prescribed functions, including adult safeguarding functions. These arrangements are partnership arrangements rather than delegation’. In addition, arrangements may only be entered into ‘if the partnership arrangements are likely to lead to an improvement in the way in which those functions are exercised’. The local authority would still remain legally responsible for how its functions (including adult safeguarding) are carried out via partnership arrangements.’ (Department of Health March 2015). decision making for concerns raised by members of staff and / or members of the public. Each organisation must have its own operational policy on how it manages adult safeguarding concerns, including a list of referral points with up to date contact details, so that staff and the public know how to report abuse and neglect. South Tyneside Safeguarding Adults Team (see Local Contacts) is the main referral point via a single point of contact which is accessible outside normal working hours, in order to respond to urgent concerns. An enquiry lead is responsible for coordinating actions under adult safeguarding, supported by other staff. The Safeguarding Adults Manager (SAM) is the local authority member of staff who manages, makes decisions, provides guidance and has oversight of safeguarding concerns that are referred to the local authority. All adult safeguarding concerns referred to the local authority should be assessed to decide if the criteria for adult safeguarding are met. Keeping the person who raised the concern informed is an essential requirement under these policies and procedures. Feedback provides assurance that action has been taken whether under adult safeguarding or not. Organisations or individuals raising concerns may want to challenge or discuss decisions and need to be updated on what action has been taken. It is more likely that the public will continue to raise concerns, where there is an acknowledgement that their concern has reached the right agency and is being taken seriously. Feedback to the wider community needs to take account of confidentiality and requirements of the Data Protection Act 1998 (DPA). The principles of natural justice must be applied, consistently with the overriding aim of safety and the requirements of the DPA. Providing information on the nature and outcomes of concerns to people alleged to have caused harm also needs to be seen in the wider context of prevention; for example, information can be used to support people to change or modify their behaviour. The person / organisation that is alleged to be responsible for abuse and / or neglect should be provided with sufficient information to enable them to understand what it is that they are alleged to have done or threatened to do that is wrong and to allow their view to be heard and considered. compliance with the Mental Capacity Act 2005. Feedback should be provided in a way that will not exacerbate the situation, or breach the DPA. If the matter is subject to police involvement, the police should always be consulted so criminal investigations are not compromised. The Local Government and Social Care Ombudsman and the Parliamentary and Health Ombudsman are both useful sources to explore case examples. The Information Commissioner provides advice on sharing information. All concerns should be considered on their own merit. An adult who makes repeated allegations that have been investigated and decided to be unfounded should be treated without prejudice. Where there are patterns of similar concerns being raised by the same adult within a short time period, a risk assessment and risk management plan should be developed and a process agreed for responding to further concerns of the same nature from the same adult. All organisations are responsible for recording and noting where there are such situations and may be asked to contribute to a multi-agency response. Information sharing to assess and analyse data is essential to ensure that adults are safeguarded and an appropriate response is made. Staff should also be mindful of public interest issues. Professional disagreements should be resolved at the earliest opportunity, ensuring that the safety and wellbeing of the adult remains paramount. Challenges to decisions should be respectful and resolved through co-operation. Disagreements can arise in a number of areas and staff should always be prepared to review decisions and plans with an open mind. Assurance that the adult is safe takes priority. Disagreements should be talked through and appropriate channels of communication established to avoid misinterpretation. In the event that operational staff are unable to resolve matters, more senior managers should be consulted with liaison between managers from different organisations where a number of agencies are involved. Multi-agency network meetings can be a helpful way to explore issues with a view to improving practice. In exceptional circumstances or where it is likely that partnership protocols are needed the SAB should be apprised. In the case of care providers, unresolved disputes should be raised with the relevant managers leading on the concern and with commissioners. Risks may be increased by complicated cross-boundary arrangements, and it may be dangerous and unproductive for organisations to delay action due to disagreements over responsibilities. The rule for managing safeguarding enquiries is that the local authority for the area where the abuse occurred has the responsibility to carry out the duties under the Care Act, but there should be close liaison with the placing local authority. The placing authority continues to hold responsibility for commissioning and funding a placement. However, many people at risk live in residential settings outside the area of the placing authority. In addition, a safeguarding incident might occur during a short-term health or social care stay, or on a trip, requiring police action in that area or immediate steps to protect the person while they are in that area. a persons’ physical, mental and / or emotional wellbeing may be temporarily compromised. Initial fact finding coordinated by Safeguarding Adults Team within three working days, liaising with all agencies involved (this is later referred to as the planning discussion). Timescales as agreed in safeguarding plan.